3 Reasons Why the Market Doesn't Like Advanced Micro Devices, Inc.
On a previous article I said, one of the reasons why Advanced Micro Devices (NASDAQ:AMD) was trading at such a low price/sales ratio compared to Intel (NASDAQ:INTC), was because AMD is a turnaround situation play and still has balance sheet issues. 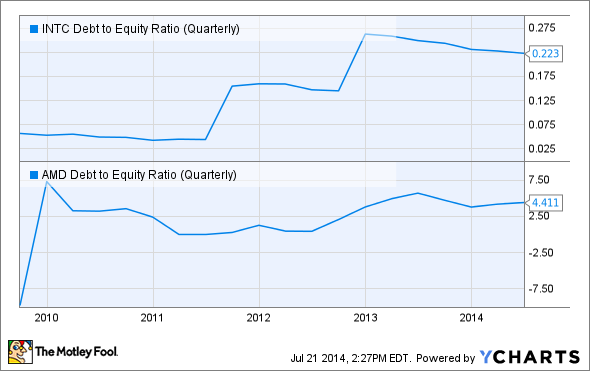 Well, as of the most recent quarter, AMD's balance sheet issues are not getting better. Cash, cash equivalents and marketable securities totaled $948 million at the end of the quarter, down by $34 million sequentially. Inventory was $960 million -- up $91 million -- primarily driven by an increase of the the company's latest 28-nanometer microprocessor products and lower shipments to channel distributors. Debt as of the end of the quarter was $2.2 billion, up by $72 million sequentially. AMD claims that this is due to "debt reprofiling activities". The company issued $500 million in 7% senior notes due in July 2024, utilizing the proceeds to buy back its 8 1/8% notes due in December 2017. The company expects to reduce interest expense by about $3 million per quarter starting in Q3 2014. However this might not be enough to calm investors. The main reason why the company can not make money is because of interest expense. Over the past 12 months the company has paid about $180 million in interest expense. Lowering this amount by just $3 million per quarter might not be enough to satisfy the market.In other words, deleveraging the balance sheet is not happening fast enough. And just to give you an idea of how much more leveraged AMD is compared to Intel, please take note of the debt to equity ratio of AMD and Intel in the chart below. While the overall PC market has shown signs of improvement -- largely driven by commercial sales -- the consumer market remains under pressure. Contrary to Intel and Hewlett-Packard (NYSE:HPQ), AMD mostly makes products for consumers and not the enterprise market. The company's computing solutions business reported revenue of $699 million, a 20% decline compared to last year. AMD's CEO Rory Read expects the overall PC market to continue to be down by 5% to 7% for the year 2014. In addition, if we read the most recent conference call transcipt, analysts seem to think that console sales will peak in the third quarter.And if that turns out to be the case, where is growth going to come from if consumer PC sales will remain sluggish and if console sales have peaked? The company does have some very interesting products in the pipeline that might help it grow in the years ahead, however success is far from certain. Seattle, the industry's first 28-nanometer 64 bit ARM server processor, is on track to launch in the fourth quarter, however it remains to be seen if AMD will be able to take server market share from Intel. And while semi-custom SoC offerings have been the reason for the company's double digit growth over the past several quarters, if growth in the segment remains flat after the third quarter and beyond (as some analysts think is the case from the recent transcript), then AMD might be in a very difficult position. The company now expects that third quarter revenue will increase 2% on a sequential basis, plus or minus 3%. This means that revenue will be in the range of $1.42 billion to $1.51 billion. This is a very wide miss from the $1.57 billion the market was modeling. And the reason is simple; if growth stalls, balance sheet repair will not happen fast enough and the market will not undertake the risk of bidding up AMD shares, betting on a turnaround, before there are tangible signs that balance sheet repair is under way. While one can also find positives in AMD's most recent quarterly report, the truth of the matter is that the number one priority -- balance sheet repair -- seems to be stalling. So until such time comes that the company is able to achieve double digit sequential quarterly growth (for an extended period of time in my opinion), chances are that balance sheet repair will not happen fast enough and the market will continue to be reluctant with AMD betting on a turnaround.